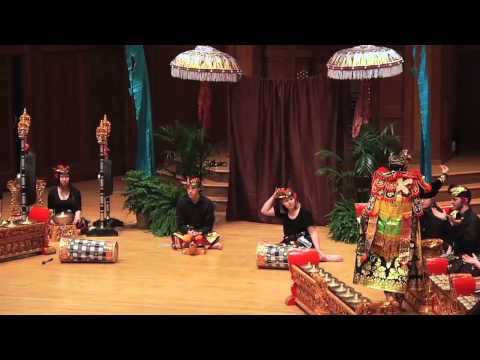 Gamelan Cahaya Asri is Lawrence University’s Balinese gamelan, directed by master Balinese musician and teacher I Dewa Ketut Alit Adnyana. The term ‘gamelan’ refers to large ensembles of metallophones, gongs, drums, and bamboo flutes from Indonesia. Studying and performing gamelan music offers a unique and highly interactive cross-cultural and artistic learning experience. Our set of gamelan gong kebyar instruments were commissioned from a highly sought-after gamelan maker in Bali in 2010, and arrived on campus in March, 2011. The metal is forged bronze, and the frames are hand-carved out of jackfruit wood. The front panels each feature a different scene from the Hindu epic story Ramayana. 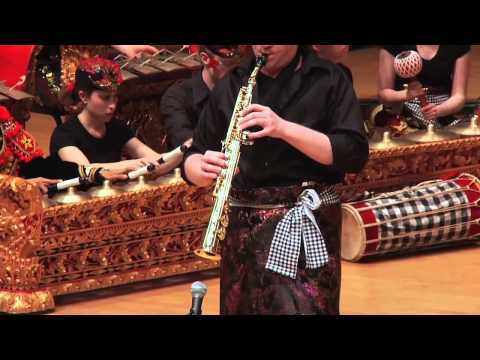 Lawrence students may enroll in this group as “MURP 171: Balinese Gamelan Music” each term. The rehearsal schedule (two 1.5 hour sessions per week) is determined each term. There is no experience required. Please visit our Facebook page for information about upcoming events! This multi-generational ensemble is open to the public and rehearses Saturdays from 4-6pm in Mursell House. As of September 2011, participants can register through the Lawrence Academy of Music. If you are interested in joining, please contact Sonja Downing.